Senator George J Mitchell, Chancellor of Queen’s from 1999-2009 and one of the main architects of the Northern Ireland peace process, has launched the second of Queen’s University’s Global Research Institutes, named in his honour. Global Research Institutes (GRIs) are the University’s flagships for interdisciplinary research in areas of major societal challenge. The Senator George J Mitchell Institute for Global Peace, Security and Justice based in the Faculty of Arts, Humanities and Social Sciences, will address the global challenge of building a peaceful, secure and inclusive world by bringing together unparalleled expertise on these issues. Researchers from fields as diverse as politics, mental health, planning and computer engineering come together with a focus on four research priority areas: legacy issues, justice and rights, security, ideology and beliefs. The launch event on Friday 24 June was attended by key players in the Good Friday Agreement, and began with a discussion entitled: What next for Northern Ireland? It included addresses from guest speakers Jonathan Powell and Tim O’Connor and was chaired by Dr William Crawley. The discussion in a packed Great Hall was followed by addresses by the Senator and award-winning author Colum McCann, after which the Senator unveiled a plaque to mark the occasion. Speaking ahead of the event, Senator Mitchell, said: “Through research, education and civic engagement, the Institute aims to make a difference to the lives of ordinary people who are struggling with the aftermath of conflict by empowering them to realise fairness, justice and tolerance. Professor Patrick Johnston, President and Vice-Chancellor of Queen’s, said: “The Institute brings together a critical mass of excellent researchers from across the humanities and other disciplines to tackle some of the greatest global issues of our age. Critical thinking and leadership are traits which have served us well in our transition into peace in Northern Ireland and through this Institute we aim to continue to have a positive impact locally and globally. In addition to The Senator George J. Mitchell Institute for Global Peace, Security and Justice, the University’s other GRIs are: The Institute for Global Food Security; The Institute of Electronics, Communications and Information Technology; and the Institute for Health Sciences. 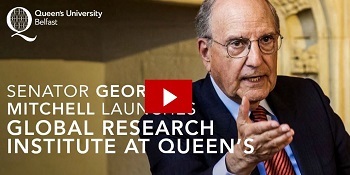 Click below to watch Senator Mitchell's latest visit to Queen's. Media inquiries to Claire Kelly, Communications Officer for Research at Queen’s University Belfast on 077 7264 9694.